Synopsis: From director Robert Altman (The Long Goodbye) comes an uproarious, high-spirited look at "Buffalo Bill" Cody, the legendary Western adventurer. 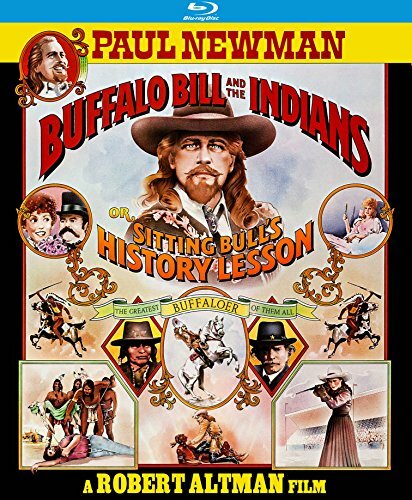 With a fine cast that includes Paul Newman, Harvey Keitel, Burt Lancaster, Joel Grey and Geraldine Chaplin, Buffalo Bill and the Indians is a hilarious yet poignant comedy that shows the "Old West" as you've never seen it before! Although Buffalo Bill (Newman) has fought Indians and Civil War battles, nothing can prepare him for his newest challenge; show business! His Wild West Show is hugely popular, but when he signs a former enemy, Sioux Chief Sitting Bull, for a featured role, a hysterical clash of cultures reverberates far beyond the boundaries of their sprawling outdoor theater. And the complications only multiply when the troupe discovers it must put on a special command performance - for none other than the President of the United States! With a library of 1,000 titles, Kino Lorber Inc. has been a leader in independent art house distribution for over 30 years, releasing over 25 films per year theatrically under its Kino Lorber, Kino Classics, and Alive Mind Cinema banners, including five Academy Award(R) nominated films in the last seven years. In addition, the company brings over 70 titles each year to the home entertainment market with DVD and Blu-ray releases under its five house brands, distributes a growing number of third party labels, and is a direct digital distributor to all major platforms including iTunes, Netflix, HULU, Amazon, Vimeo, Fandor and others.